The experience that you will have at Hieronymus Seafood Restaurant & Oyster Bar is uniquely Wilmington, North Carolina. 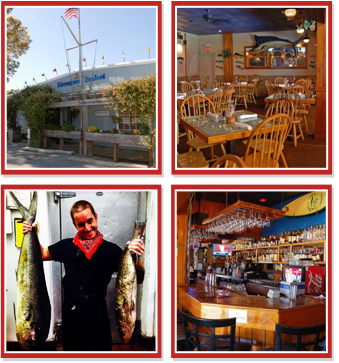 Our specialty is Cape Fear cuisine, including fresh local seafood, fresh vegetables, and local craft beer. When you walk through our doors, take a look around. You will see many items that are a part of our history. The shells inside the tables have been brought to us by many guests throughout the years. Nameplates on the bar designate locals that have told many a tale. News releases show Hieronymus cooking for Bryant Gumbel on the Today Show. You might copy a recipe for soft shell crab or take a gander at some of the "stars" that have dropped by for dinner. Your next meal away from home will truly be special with casual dining at our seafood restaurant in Wilmington, North Carolina. All of this began in 1972 when Glenn Hieronymus bought a commercial fishing boat. From the oceans, he and his brothers harvested a bounty of grouper, flounder, mahi-mahi, scallops, black sea bass, snapper, cobia, tuna, and shrimp. From the marshes, they pulled oysters and clams. In 1980, Hieronymus Seafood Restaurant & Oyster bar opened on Market Street. We serve you seafood from such exotic locations as Hampstead, Sneads Ferry, Topsail Island, and Motts Channel at Wrightsville Beach. The vegetables come from our Granny Royal's garden (no kidding), and you will be served by people from all over the country that now call Wilmington home. Our corporate offices are in the corner, and if you would like to see the owner, just tell your server.